"Fantastic Four" star Chris Evans will play Captain America in not just one, but multiple movies, according toThe Hollywood Reporter. 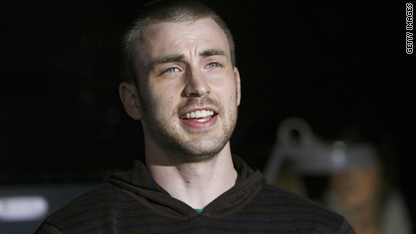 Evans played the Human Torch in the two recent "Four" movies. As my fellow comic book geeks will know, Cap and Human Torch are two very different characters. Of all of the things wrong with the "Fantastic Four" movies (and oh, there were many), Evans' portrayal of Johnny Storm was aggressively annoying. On the other hand, the Torch is quite literally a self-involved "hot head," so I'm not sure if that performance was necessarily so far off the mark. Captain America, on the other hand, is the very model of a stoic, noble super-soldier. Supporters of Evans taking the role point to his good work in other films and Cap doesn't appear to be a major acting challenge, per se. Of course, the script will likely be more of a determining factor in whether the movie is any good or not. Something I would more take issue with is that Evans and some of the others who were rumored to be considered for the role - like Mike Vogel, John Krasinski, and Channing Tatum (who was all wrong for "G.I. Joe's" Duke, but that's another story) - seem to lack the gravitas needed. Captain America will next appear in "The Avengers" movie(s) and should be a leader/elder statesman (I mean, he did fight in World War II, frozen in ice or not). The folks behind this online movement to cast Jon Hamm seemed to have the right idea, but it appears that he was never given serious consideration. What do you think of the decision to cast Evans? Do you think he can do Captain America justice? Share your reaction on video, or in the comments below. i'm psyched for Evans as Cap. i think that people were waaaaay too snobby about the Fantastic Four movies - they were fun popcorn flicks and they did a pretty good job translating the FF personalities to the screen. i actually thought that Evans was the best of the bunch, capturing Johnny's cocky and quippy attitude with charm. that's still a ways off from Steve Rogers' personality, but i'm interested to see Evans switch it up. and just like Jackman did with Wolverine, making him a bit more accessible for a movie audience, maybe Evans can help create a less stiff Captain America for viewers. most live-action and animated Cap performances up till now have been very rigid and lack the strong charisma that Cap has every month on the page. Lame. Where's the continuity. Where's the canon? Sure, theres very little chance that the FF would cameo in any of the new Marvel movies, but I'd like to think that they do exist in the same universe, hence could not be the same person. I always felt Matt Daimon would have worked as Kirby cap. He certainly has a big enough head to slap a big "A" on. I had thought Marvel had been looking for an "unknown," so why they were eyeing so many "stars" and ultimately picked one they'd seen in two of their movies escapes me. Just hope he can pull it off. Um.......what are they thinking? I like Chris Evans and all but are there no other young male actors in America that have not played other Marvel characters? I mean......um....just baffling. I guess it's better than Channing Tatum....who, in my opinion, doesn't have the acting chops to make it into a High School play. Chris Evans as Captain America? Meh. I don't understand why they keep selecting starts to act in multiple super hero roles...am I really supposed to believe this guy is Captain America when I just got done watching him 'flaming on' in The Fantastic Four? To JOel RE: "You can't cast the same person for multiple superhero roles. Marvel fails and I will not be seeing this ridiculously lame casting because I am boycotting the movie." YOU fail. Captain America is a DC comic. Gerald Butler should've been the Capt. What will happen when/if the Fantastic 4 eventually get involved with the Avengers? @"the drunken recollection" you guys are spouting off people who would never meet in the same universe......duh Indiana Jones wouldn't meet Han Solo, Cap of the enterprise would never meet professor x. I mean really what were you guys and Andrew thinking when you posted your comments? It's likely that Marvel will reboot Fantastic Four and the new cast will appear alongside The Avengers. This is along the same lines as Batman being rebooted for The Justice League, apparently. What can we learn from the origins of "Captain America"? Emory University bioethics professor Paul Root Wolpe explores the roots and ideas of American mythology and how it is connected to this patriotic superhero. Check out the link below!